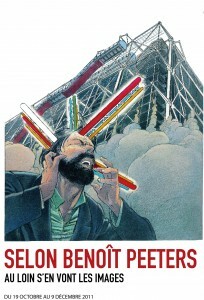 November 30, 2012 Benoît Peeters will have another session in Centre Pompidou (Paris). This session is named ARCHIFICTIONS . Architecture supplies the literature (e.g. Species of Spaces by Georges Perec The House sheets of Mark Z. Danielewski), movies, comics and art. Sometimes, it ceases to be realized even to be pure fiction. Benoît Peeters meet François Schuiten (designer of the Obscure Cities albums and stage designer), Philippe Rahm (architect and artist) and Didier Faustino (architect and artist). The session starts at 18h30 with showing the following movies: Projection de Urbicande (2003, 7’) de Simone Bücher, de Exploring Dead Building (2010, 13’52’’) de Didier Faustino et de Météorologie d'intérieur (2008, 3’37’’) de Philippe Rahm. This blog post was created on 2011-11-27 at 11:35 and last modified on 2018-05-06 at 08:40 by Joseph Le Perdriel.